This 1971 MGB GT was worn out, wrecked, and left derelict by the mid 1980s. My buddy Donnie Moyer discovered it on an old farm, tucked behind Dulles airport in Northern Virginia. Donnie and I had been talking about building a racecar. We were college freshmen: clueless and poor. 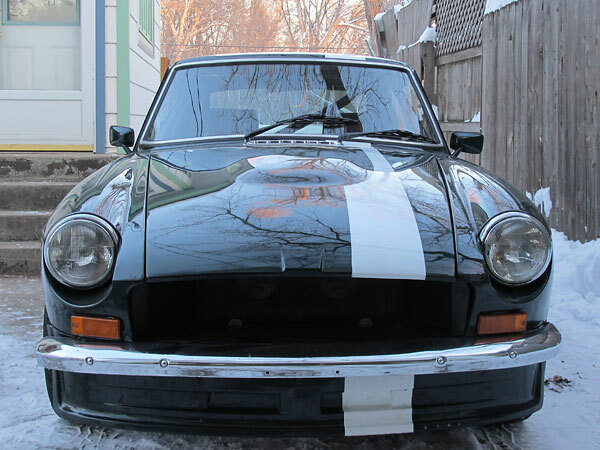 But this little MGB GT could be had for one dollar if we could convince its owner that we'd give it a good home. (We also had to fix his wife's Oldsmobile; that only took a moment.) He had turned down offers from people who wanted his MG for parts. We promised we'd put it back on the road, and that's what he wanted to hear. We went to work with baling wire and duct tape, second hand tires, discarded road signs, alligator clips and chewing gum. 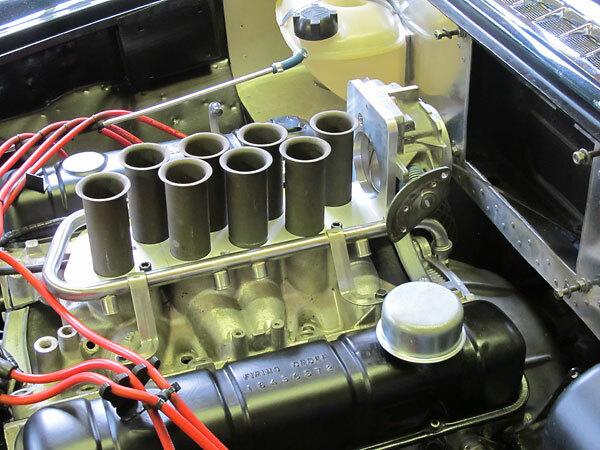 We managed to get the original MGB engine to run; we even put one or two thousand miles on the old girl. She burned a whole lot of oil! 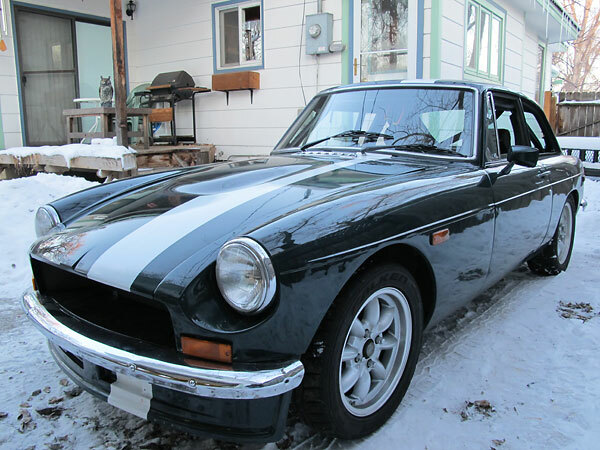 At about that time, we christened our cute little MGB GT "Bonnie". Why that name? Suffice it to say that she's always had a distinctive "bonnet" - that's British for "hood" - and incidentally she's now wearing her fourth one. 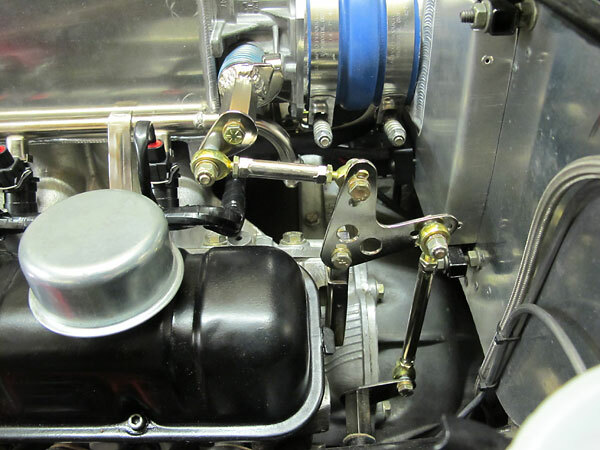 Anyhow, just when we thought we had her carburetors sorted out, Bonnie threw a connecting rod. We had to park her while we finished college, but we continued to think she might make a good racecar someday. 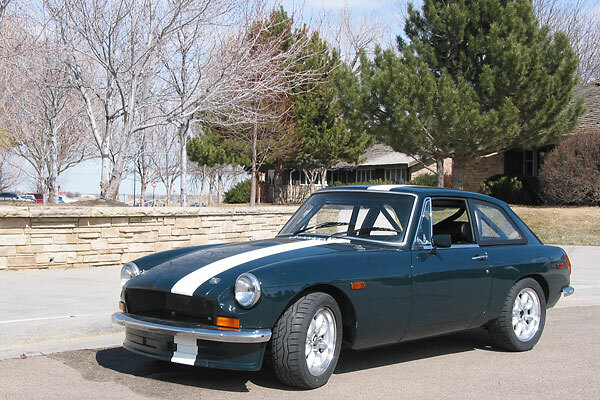 Largely ignorant of SCCA class restrictions, our daydreams included American V8 engines. We soon learned that Buick's "215" aluminum V8 is the most important production engine in the history of motorsport. It's the only American V8 to ever win a proper Grand Prix. One of these little aluminum V8s powered Jack Brabham to victory in the 1966 Formula One World Championship. Buick's 215 is also the production engine that ended Offy's monopoly at the Indy 500. In 1962 Dan Gurney used a Buick 215 in his "Rookie of the Year" appearance, paving the brickyard for followers like Jim Clark with a Lotus-Ford. More relevantly: a stock Buick 215 delivers twice the power and torque of an MGB 4-banger, yet weighs fully forty pounds less. And it's a V8. And I found a running 1963 Buick Special for $150. After college, I settled in North Carolina and Bonnie moved into the parking lot of my apartment building. I built up the Buick engine in my living room. 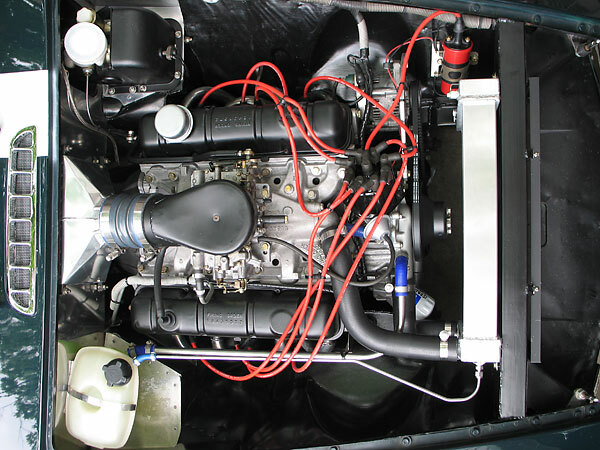 With help from two of my Volvo Truck colleagues, Ashley Dudding and Rob Henson, I installed the engine in 1990. In 1991, Bonnie was complete enough to pass the state's safety inspection. She was still pretty rough looking, but she was drivable. Since then, my plan has always been to drive her in warm months and improve her in cold months. She's been extensively modified and upgraded over subsequent decades, but always on a shoestring budget. Over all that time, Bonnie has never gone more than a few months without being driven. She has completed many long cross-country road trips. She is occasionally used for track days and for autocrosses too. Perhaps one day she'll evolve into the fierce little racecar she's always wanted to be. 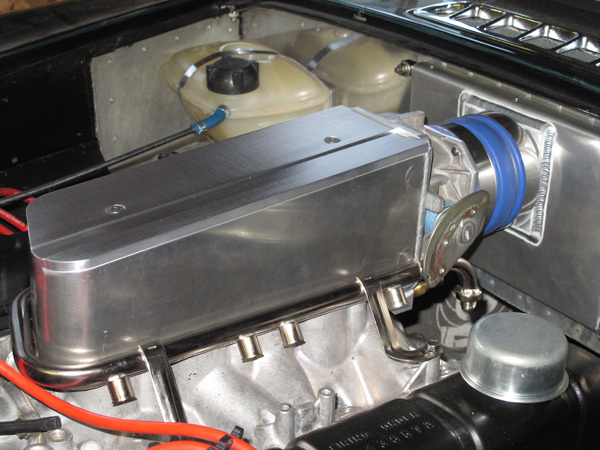 fuel injection and a custom crank-fired eight-coil ignition system. 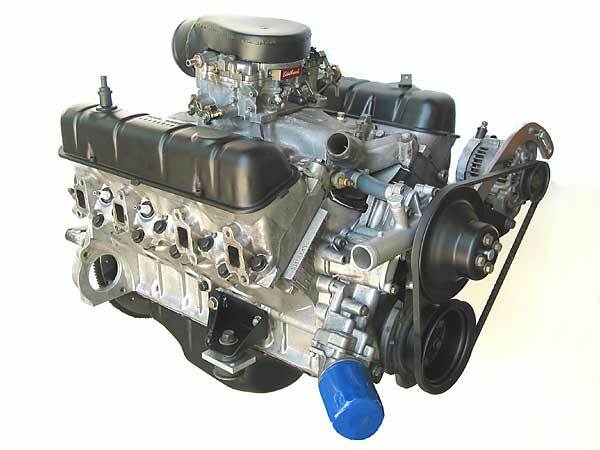 Engine: stock Buick 215 engine block, crankshaft, connecting rods, valve gear, valve covers, oil pan, timing gears, etc. Silvolite 8.8:1, 0.030" oversize pistons. Kenne-Bell camshaft (model 1XA, 0.462" lift, 260 degree duration, 110 degree lobe center). Buick V6 timing cover. Buick V6 "metric" oil pump. 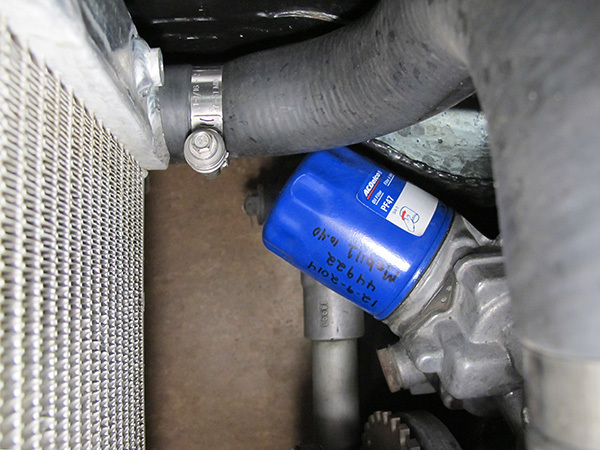 AC Delco PF47 oil filter. 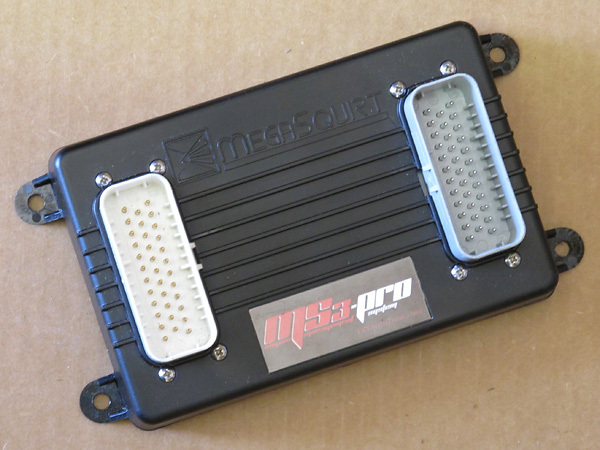 MegaSquirt MS3-Pro engine control module. Rover 14CUX intake manifold and fuel rail. 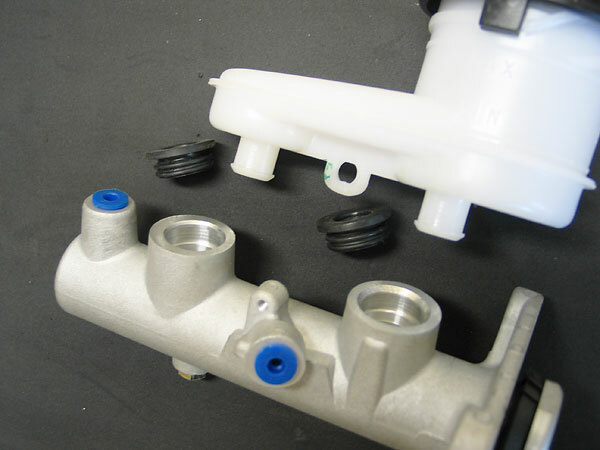 Lucas fuel injectors and fuel pressure regulator. Chevrolet throttle body and MAP sensor. 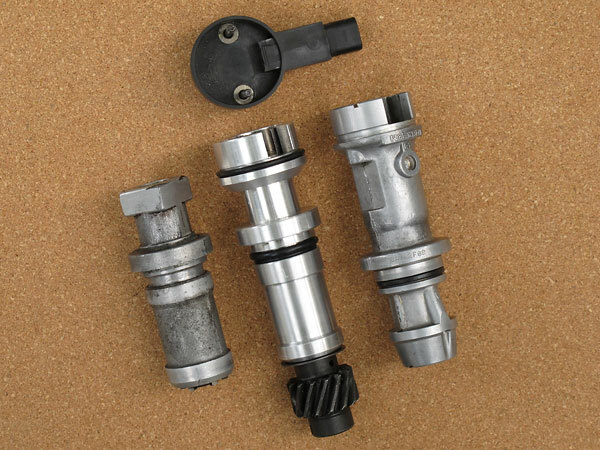 Chevrolet "LS2-truck" ignition coils. Champion "Truck" spark plugs (part# 4404). 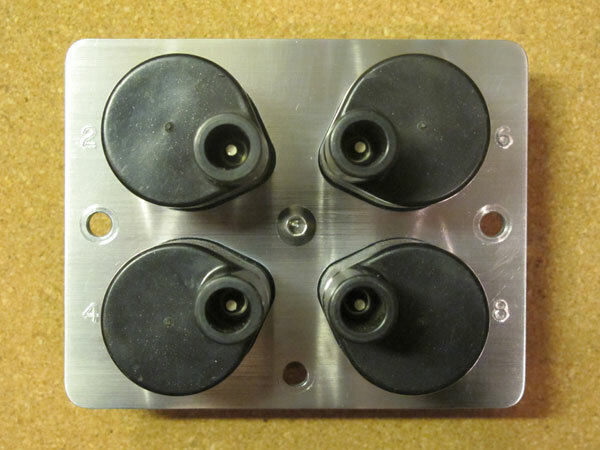 Custom motor mounts, utilizing Barry Controls 22000 series isolators. 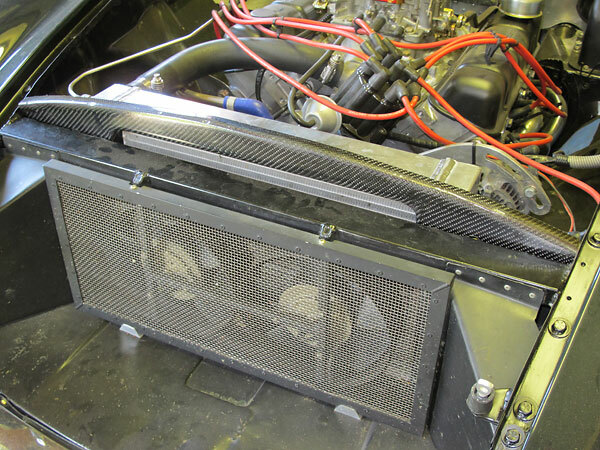 Custom cowl induction intake with Ford Probe oiled gauze panel air filter. 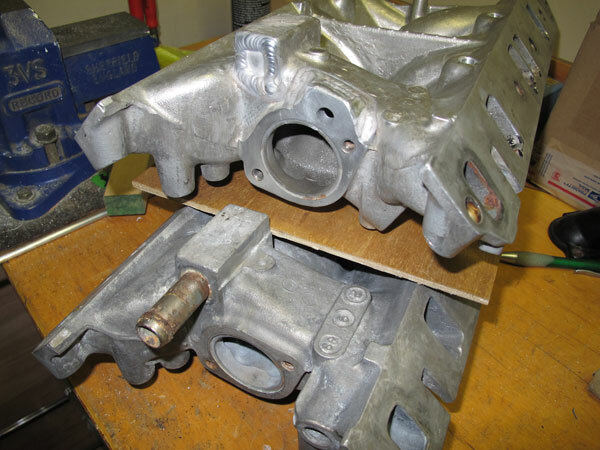 Original Buick cylinder heads were replaced in May 2009 with Rover 4.0L heads (circa 1996-2003). These late model heads have smaller combustion chambers (~28cc vs. ~37cc). 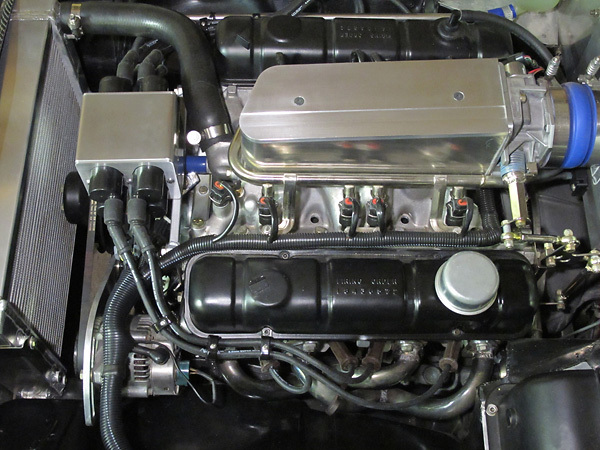 Shaved 0.010" and with composite head gaskets, they raised the engine's static compression ratio to ~10.1:1. The Rover 4.0L heads also have larger valves (1.570" inlet vs. 1.5", 1.350" exhaust vs. 1.312") and significantly larger ports. 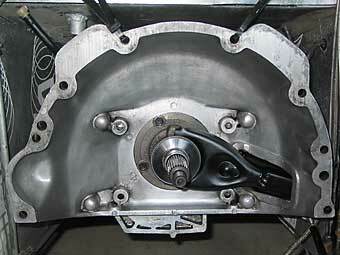 For compatibility with the relatively high-lift camshaft, it was necessary to reduce the height of the valve guides. Stock valvesprings were checked for coil bind, and found to be okay. All head work was performed by Abacus Racing. 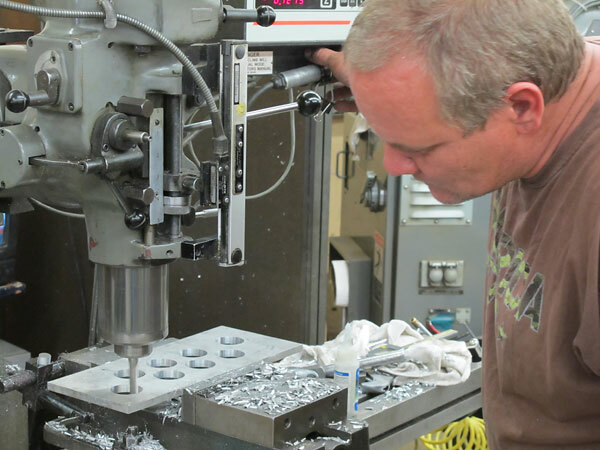 At installation, lifter preload was set to 0.040" by making and installing custom pedestal shims. remained unchanged since then, while nearly everything else in this photo has been upgraded. 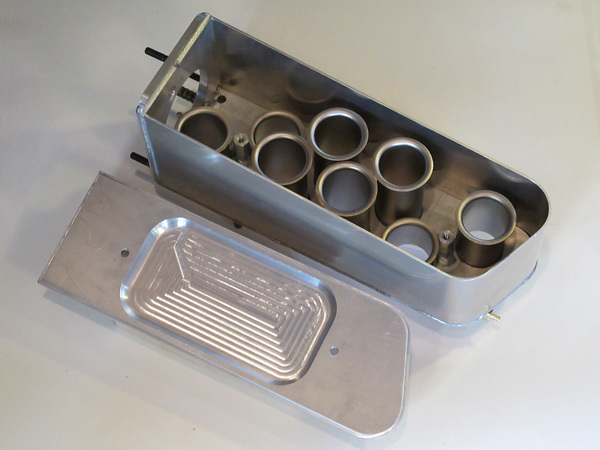 Cooling: AFCO dual-pass aluminum radiator, part number "80107N", reworked with 1.5" ports and a bung for a vent line. Core size = 12" by 17.75". Dayco hoses (top: #70635, 1970-1979 Camaro and Monte Carlo. bottom: #71013, 1969-2006 Ford Mustang.) 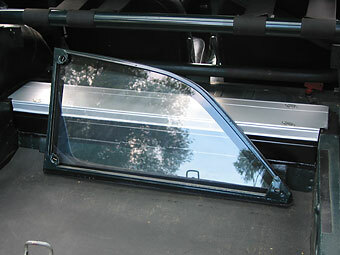 Transparent remote header tank (1990s VW Jetta, part# 171121407E) installed on firewall. 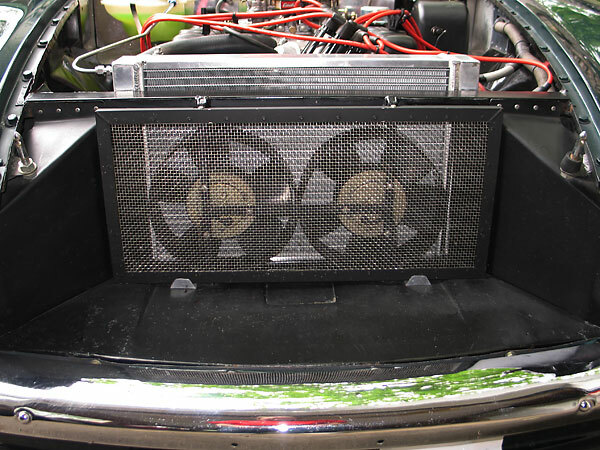 Twin 8.5" Honda Civic electric A/C condensor fans, pushing. Low-clearance fan rings. Custom carbon fiber recirculation shield. Stainless steel mesh bug screen. Exhaust: custom sand bent Tri-Y headers. 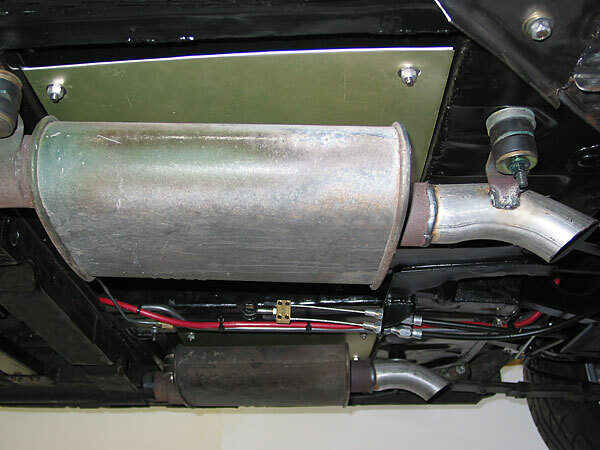 Dual Thrush Turbo mufflers. Transmission: 1992-model Borg Warner T5 "World Class" 5-speed manual. 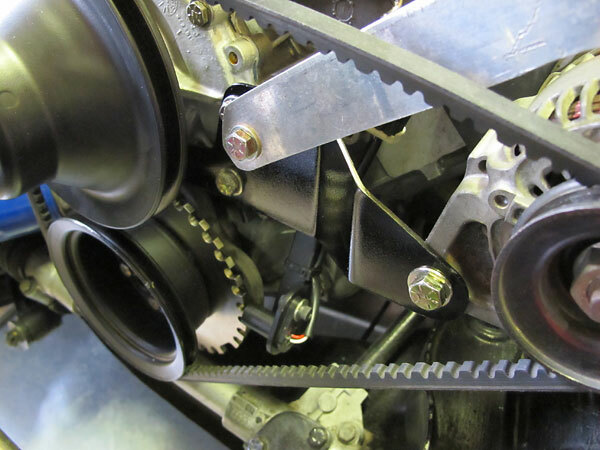 Gear ratios: 1st=2.95, 2nd=1.94, 3rd=1.34, 4th=1.00, and 5th=0.73. 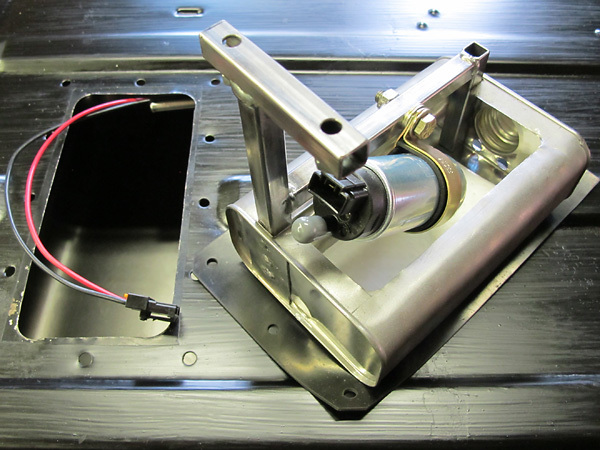 Custom transmission mount, utilizing Barry Controls 22000 series isolators. Buick 215 bellhousing. D&D Fabrications steel flywheel. 10.4" Camaro clutch and diaphragm pressure plate. Externally mounted Girling slave cylinder. 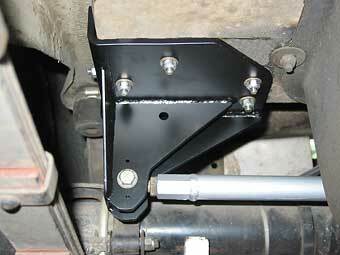 Front Suspension: See below for details. Dropped spindles. Eibach 525# springs. Gutted Armstrong lever-type shock absorbers serve as upper control arms and upper mounts for GAZ adjustable coilover shock absorbers. Spring pans from a Moss coilover front suspension kit, lightened. ADDCO front anti-sway bar on polyurethane mounts. Rear Suspension: Stock leaf springs, although they've sagged badly. Custom extended shackles to raise the rear ride height back up. Telescoping shocks ('84-'88 Dodge Colt, Monroe 5877ST). Custom fabricated Panhard rod. 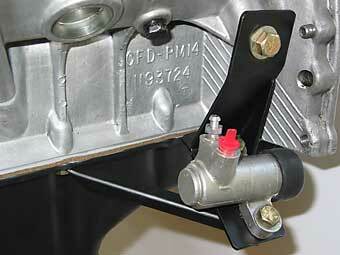 Brakes: new MGB master cylinder. 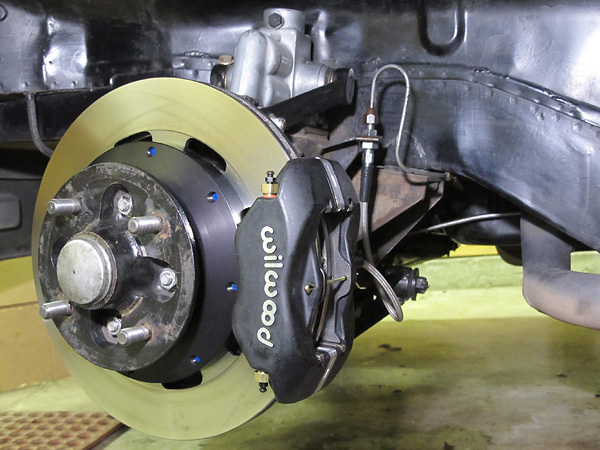 front - Classic Conversions (Wilwood) big brake kit. Wilwood 2psi residual pressure valve. rear - Ford 9" diameter drums, 13/16" wheel cylinders, Wilwood 10psi residual pressure valve. Lokar parking brake cable set connected to (3/4") extended MGB lever. 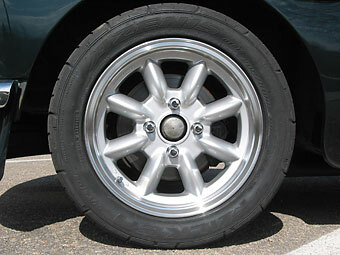 Wheels/Tires: Panasport 8-spoke wheels (15"x6", -22mm offset, 15.0# each, polished rim). Dunlop Direzza DII tires, size 205/50R15. McGard 64000 lug nuts (1/2"x20 by 1.5", cone seat). 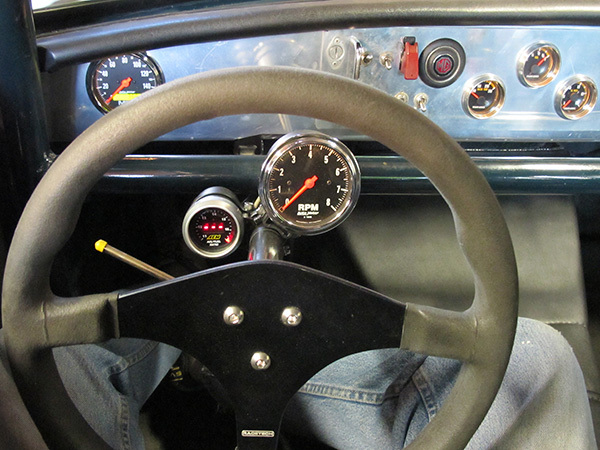 Spring 2016: Autometer Speedometer model 2489 and Tachometer model 2499. Instruments: Speedometer - Autometer "Traditional Chrome" model 2489 (0-160mph). Air/fuel ratio - AEM, electronic. Used with a Bosch UEGO wideband oxygen sensor. Tachometer - Autometer "Traditional Chrome" model 2499 (0-8000rpm). Fuel level - Stewart Warner "Track Force", electrical. Oil pressure - Stewart Warner "Track Force", mechanical. Water temp - Stewart Warner "Track Force", electrical. Electrical: Nippondenso 55A internal regulator alternator from a Chevy Swift. 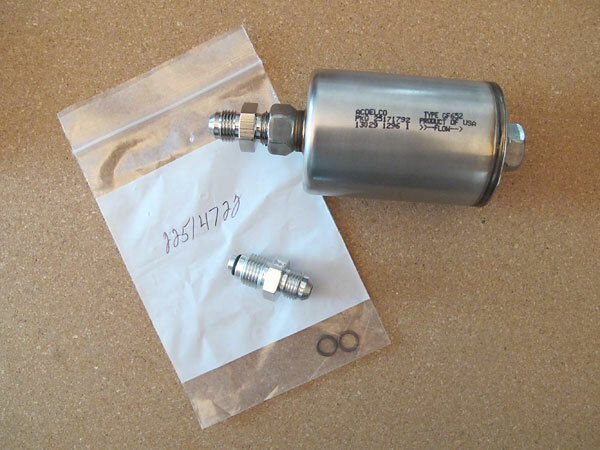 (Suzuki part# 31400-86210, Nippondenso part# 100211-4150.) 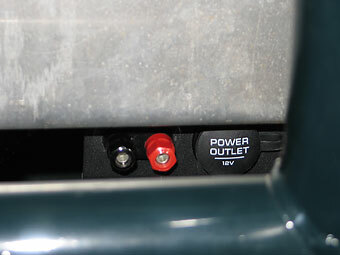 Single 12-Volt battery in passenger-side location. FIA-approved battery disconnect switch with removeable key. (Separate contacts disconnect the alternator before the battery.) All new home-made wiring featuring crosslink insulation (instead of PVC) and Metri-Pac connectors. Where possible, wiring has been moved inside the cabin (instead of running under the floorboards, etc.) 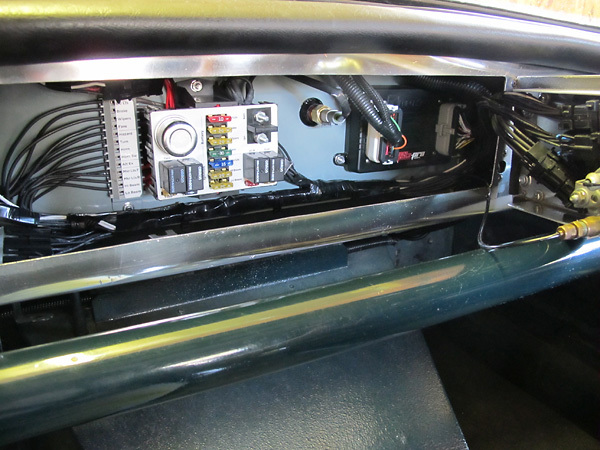 Ten fuses and four relays are mounted under the dashboard where it's cleaner, drier, and cooler. Lighting: Wipac "Quadoptic" (Made in England) H4 halogen headlamps. VW Jetta front turn signals (part# 165953155), Hyundai Excel side markers. LED taillamps (see below). Toyota Corolla license plate lamps. Chevy S10 rearview mirror with integral map lights. Body: custom carbon fiber bonnet from Preform Resources. 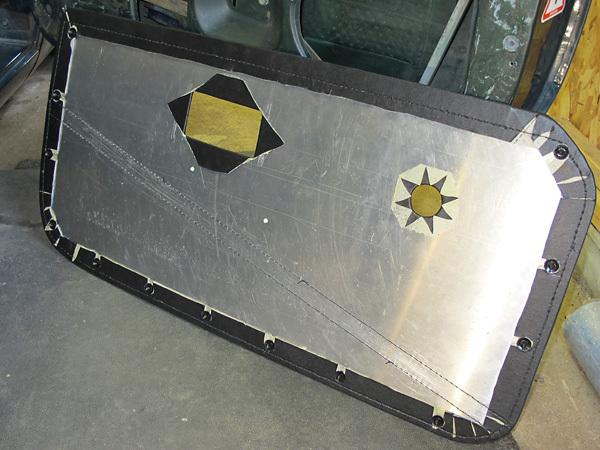 Ureflex air dam. 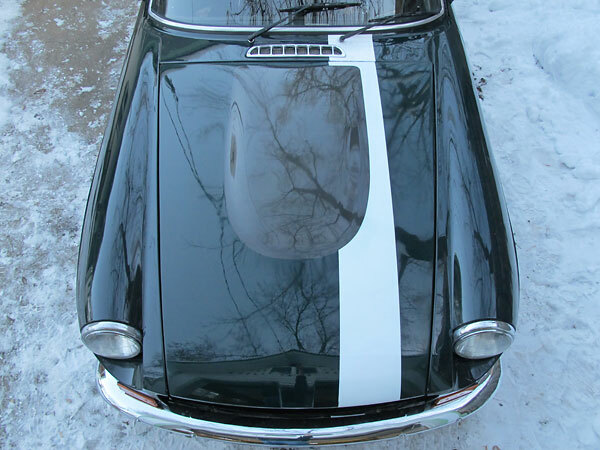 PPG Deltron basecoat/clearcoat in Jaguar "Brooklands Green" (see below), with a white Sebring stripe. 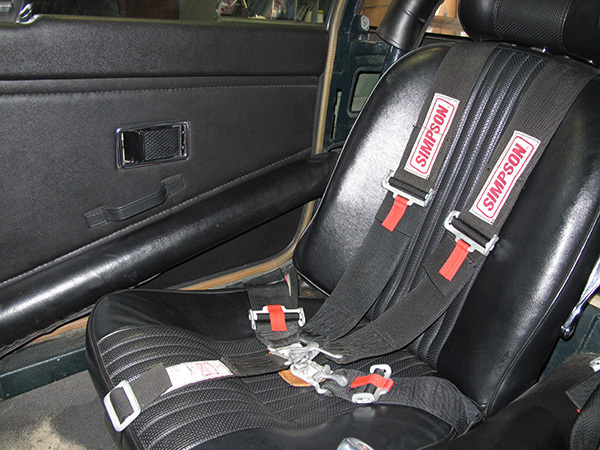 Interior: six point roll cage. (Stitched/seam-welded body seams in the engine compartment too.) Simpson 5-point latch-and-link safety harnesses. 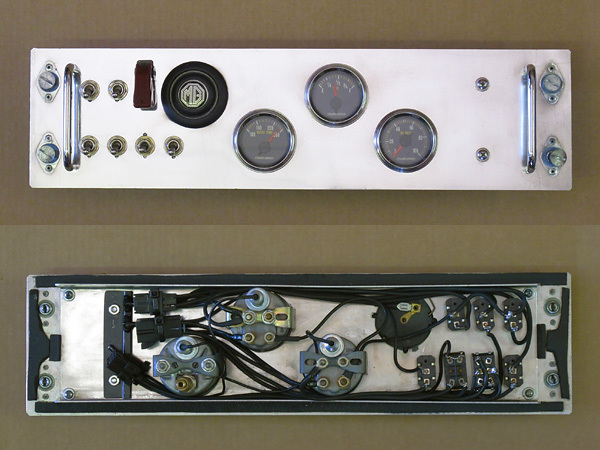 Home-made aluminum dashboard (with early-model MGB padded eyebrow). 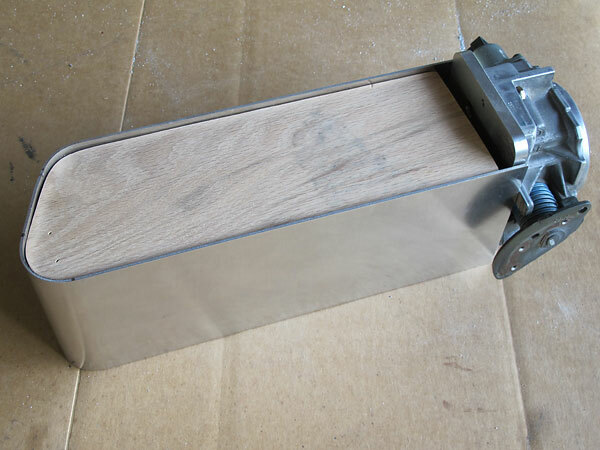 Aluminum door trim. Custom quickly-removable polycarbonate rear quarter windows on lightweight steel box-tube frames held in by three quarter-turn (Dzus) fasteners per window. Built-in toolbox in cargo area. Owner's Comments: This little car still makes me smile every single time I drive it. I've had her over twenty-five years and I'm comfortable with her. She is by nature and intent a continuing project. Since sorting out the conversion, she's proven very reliable. Frankly, I've driven much more powerful and refined MGB V8 conversions, but "Bonnie" still feels, sounds and looks more like a racecar than any other MGB I've driven. Being a GT, plus having a cage, my car is really noticeably more rigid than others. In my opinion that's a great thing. My main plan for the future is just to drive more! 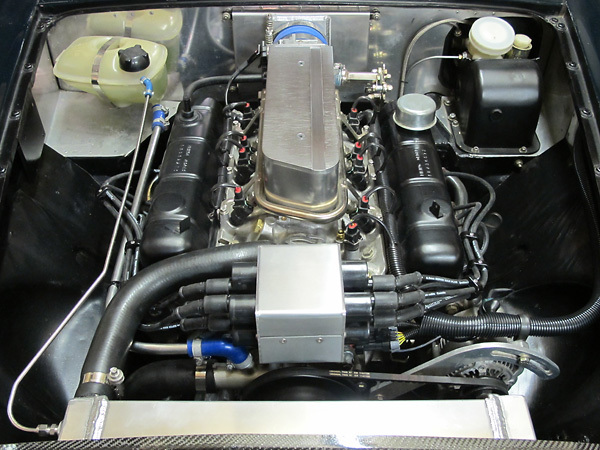 As measured at British V8 2013, this car weighed 2150 pounds "wet" (i.e. full tank of fuel). 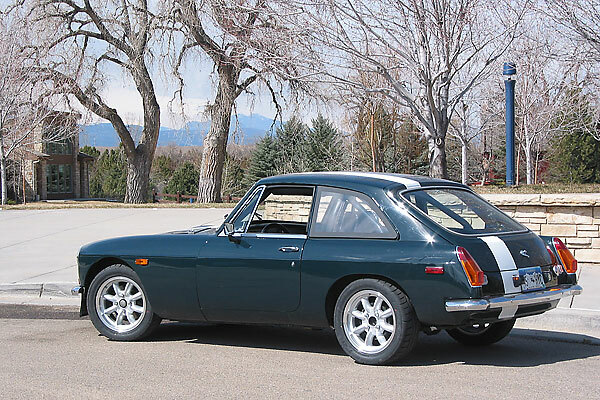 That's about 160 pounds lighter than original, and 277 pounds less than a "factory" MGB GT V8. Corner weights: 521 (LF), 546 (RF), 542 (LR), 541 (RR). Distribution: 49.63% front to 50.37% rear. a popular Jaguar color. 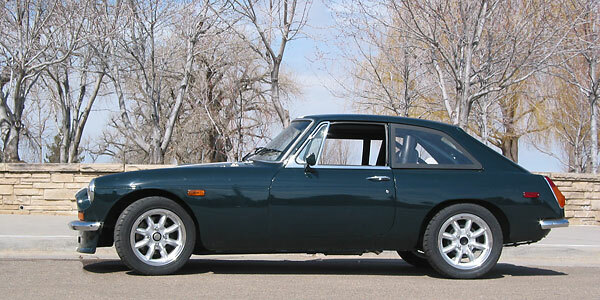 From 1991 through 1998, Jaguar called this shade "Brooklands Green"
British Racing Green. The white stripe is Ford's "Performance White". This paint job has never been "rubbed out" and in twenty years it has also never been waxed. simply leaving it alone. Car waxes aren't durable, and applying them causes swirl marks. More recent photos of Bonnie may be found here: Moss Motors' 2014 Motoring Challenge! 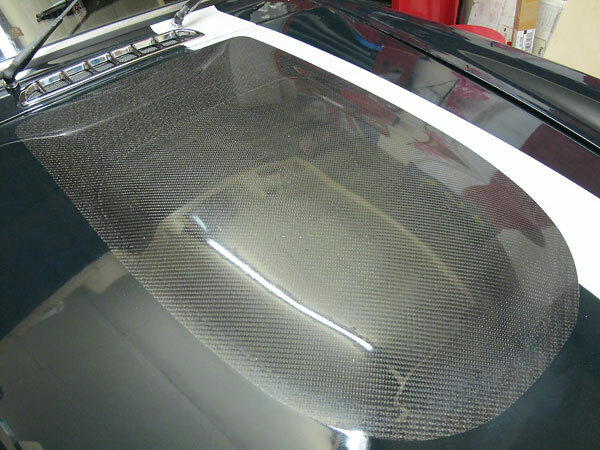 In 2011, my good friend Dave Craddock of Preform Resources built this custom carbon fiber bonnet. The new bonnet weighs less than five pounds! That's over twenty pounds less than a steel one. I reckon Bonnie probably has the lightest weight bonnet of any MGB in the entire world. MG's steel bodyshell above the original hinge positions. 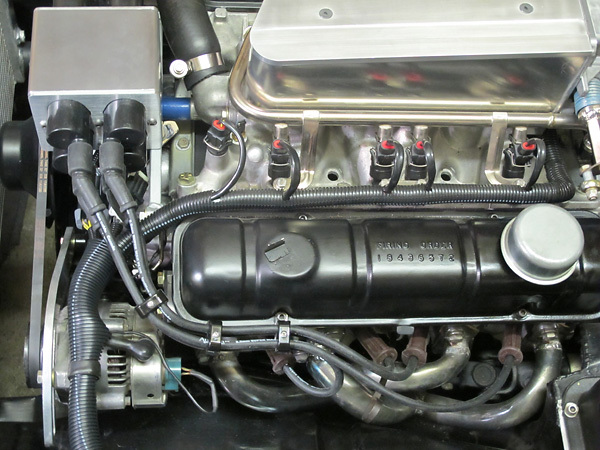 The large "RV8 style" bulge in the bonnet provides room for a new induction system (see below). "When you got it, flaunt it!" 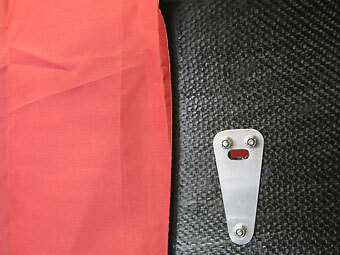 - It would be a pity not to show off a little of the carbon fabric. 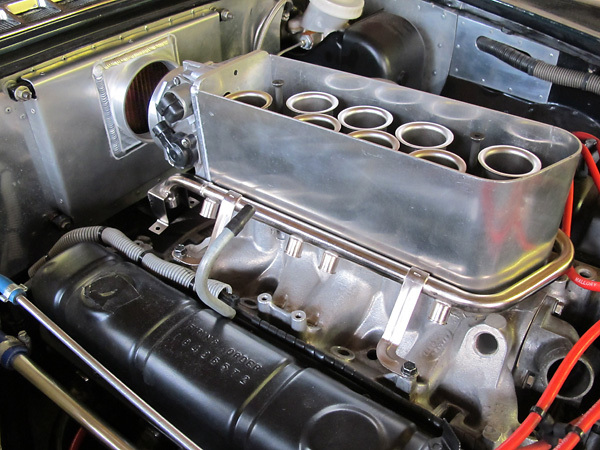 installing OMP aluminum hood pins (part# EB/492/A), I crafted aluminum reinforcements. weighes about five ounces! It'd be even lighter if I had tools for vacuum bagging. recirc shield out of aluminum or whatever, but learning new fabrication techniques is fun. adjustable coilover shock absorbers from Moss Europe and Eibach 525 pound/inch springs. 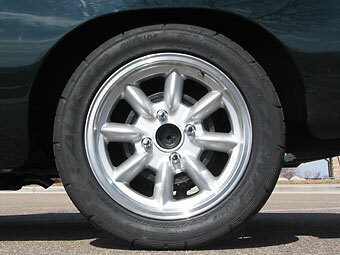 have been modified to minimize bump steer associated with the lowered ride height. sourced from Bill Guzman at Classic Conversions Engineering. custom built/programmed MegaSquirt (speed-density) control system. with a Sharpie, and then use a propane torch to heat the surface until the line disappears. 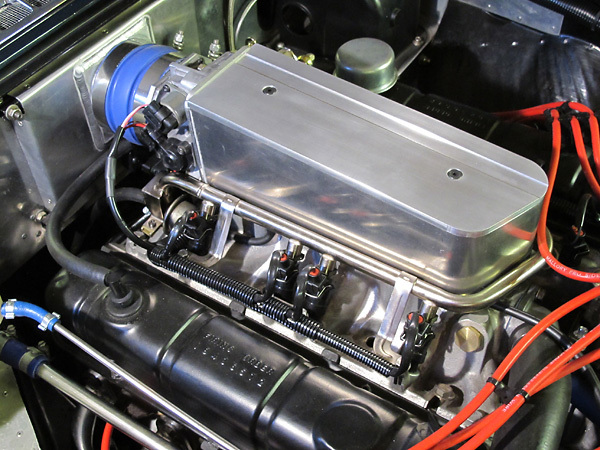 December 2012: a Rover fuel rail has been extensively modified, then electroless nickel plated. The plenum wall has been welded up. I also fabricated a new air cleaner housing. This photo shows attachment of a PCV and MAP sensor port block to the bottom of my plenum. 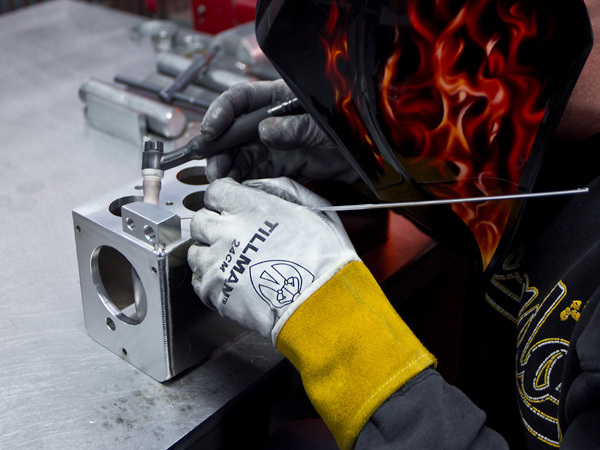 The guys at Peterson Fluid Systems in Denver certainly do beautiful TIG welding, don't they? Top: Rover intake manifold thermostat bypass has been relocated to suit Buick style timing cover. 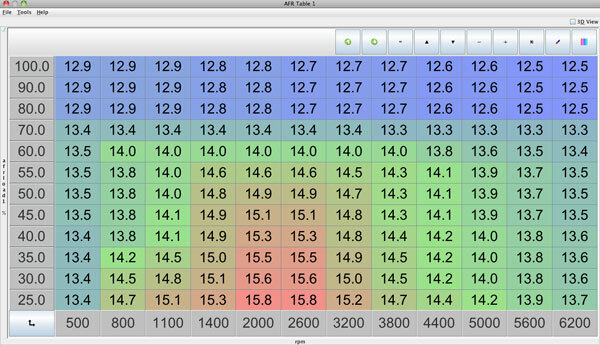 shortened significantly compared to the trumpets for cylinders #2 and #8. Plenum wall trimmed down (at an angle) and capped with a lid. Note racing stripe offset to one side, to echo my car's paint scheme. My very good friend Scott McRoberts has been incredibly helpful with this project. I heartily recommend his family business: McRoberts Machine of Longmont Colorado. The throttle linkage is rather elaborate, but it seems to work well. I sent it and some other parts out to be electroless nickel plated. output. Instead of producing a 0 to 5 volt waveform, the output toggled between 5 and 8 volts. So... this is a second generation Hall effect sensor on a second generation bracket. 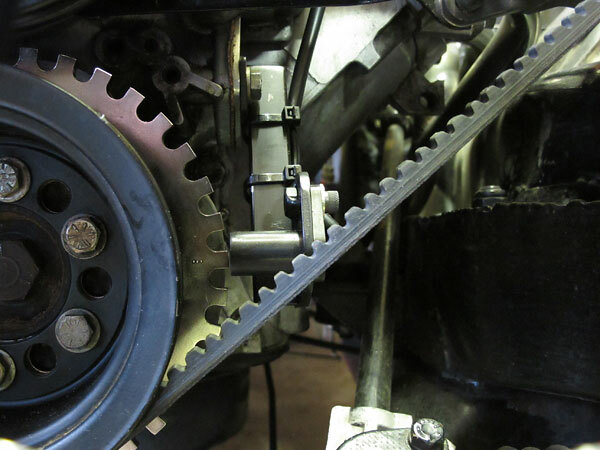 balancer and crank pulley on the six existing bolts. (Buick's six-hole pattern is unusual. water pump pulley and a new outboard bracket (and spacer) for the alternator. 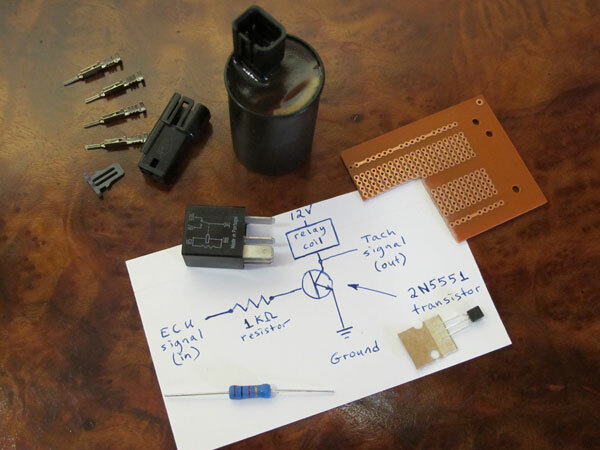 support electronic ignition and they're handy for all sorts of data logging too. 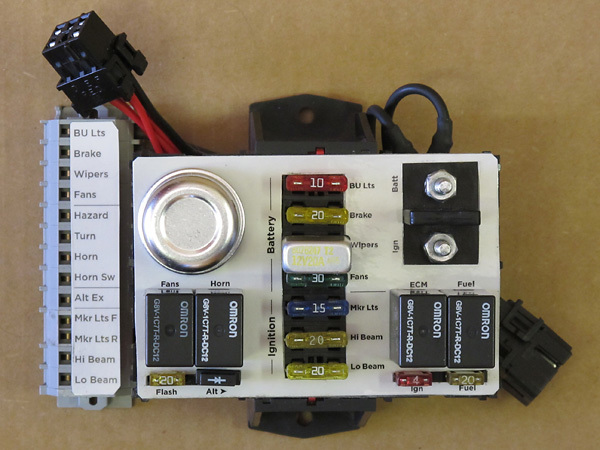 relays and make the long-overdue upgrade from glass fuses to blade fuses. This new fuse and relay center will be mounted on the firewall next to the MS3-Pro ECM. could potentially compromise the ability of the control module to "hear" various sensors. 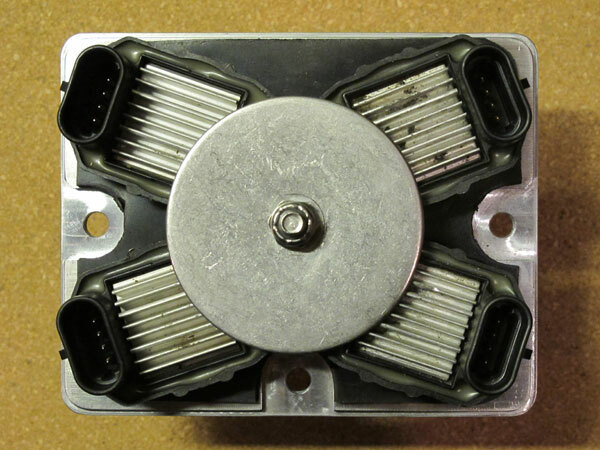 Part of this fuseblock was assembled by American Autowire (and marketed as a "Comp-9" kit). it was easy for me to add a two-#10-power-stud block and also a two-relay-two-fuse block. I also re-wired one of the previously existing relays to control my radiator cooling fans. is mechanical, and in this view you can see the hose that connects to it. 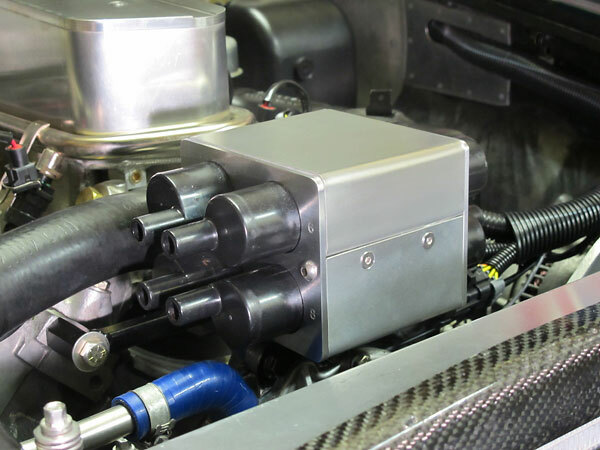 In-tank fuel pumps offer major advantages: fuel cools them and also muffles their noise. mount a Walbro GSS250 (190 liter per hour) fuel pump at a 45 degree angle. A Honda Civic (1992-on) prefilter facilitated the installation. materials in my recycling bin: an old solvent can and scraps of half inch box tubing. 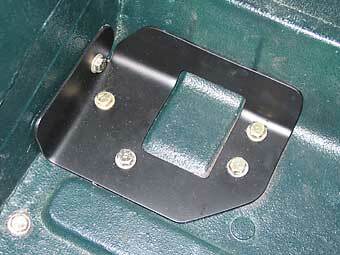 be used as a return line directly to the false sump. paint along its routing. 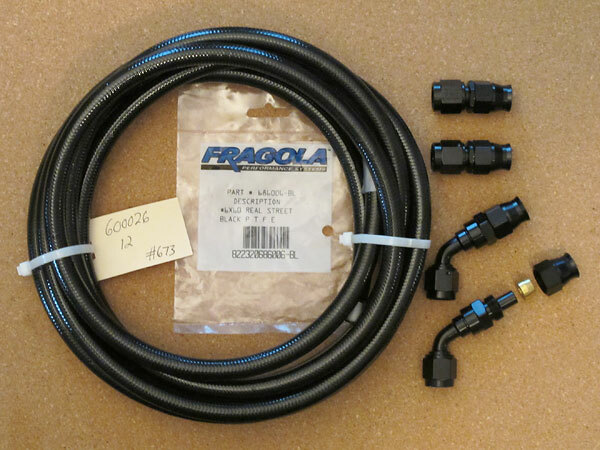 Fragola straight AN-6 fittings are used at the fuel filter. Fragola sixty-degree swivel fittings are used at the fuel rail and fuel tank. trouble free service. AN-6 adapter fittings mate it to the new fuel lines. assembly, and then covered in nylon convoluted tubing of various sizes. 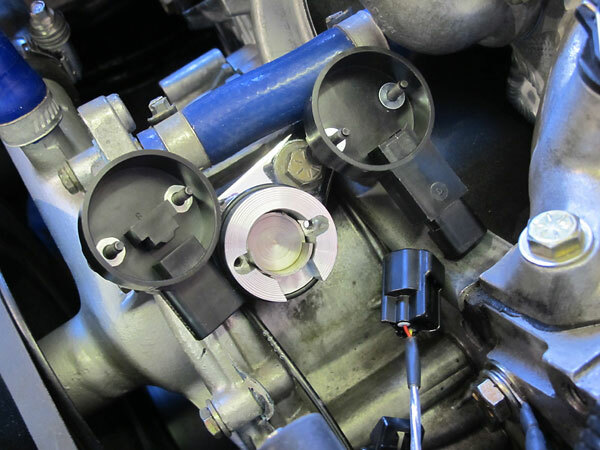 connections on the side of the throttle body assembly. new custom part in the center. My good friend Scott McRoberts did the machine work. 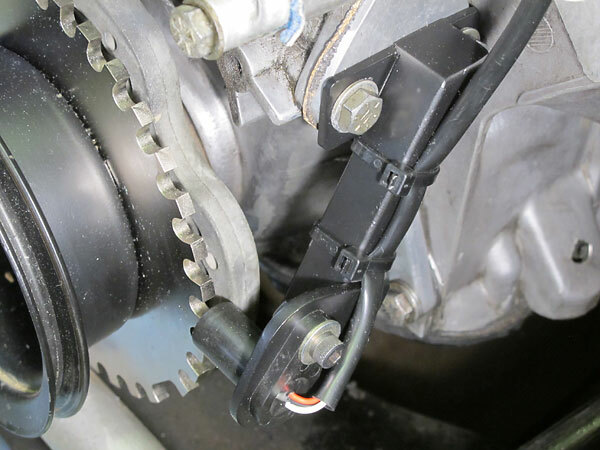 position when the crank sensor detects a missing tooth and immediately sync ignition timing. 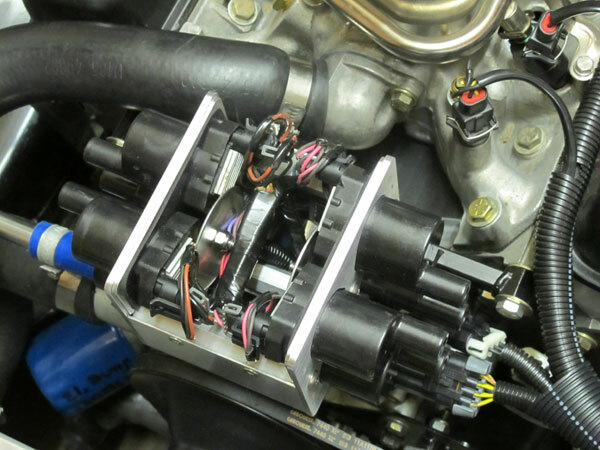 Here's the mount I invented to hold eight Chevy LS2 Truck ignition coils. These coils are bad boys - possibly the most powerful coils ever installed by a major OEM. 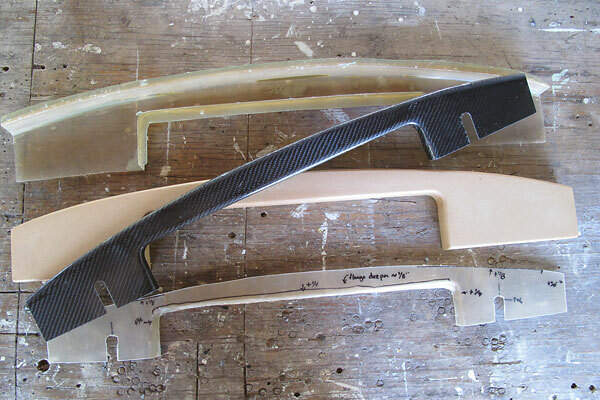 A neoprene gasket provides a modest measure of vibration isolation. This bracket spans between the cylinder heads and a boss on the timing cover. The top cover snaps back on neatly and tightly. 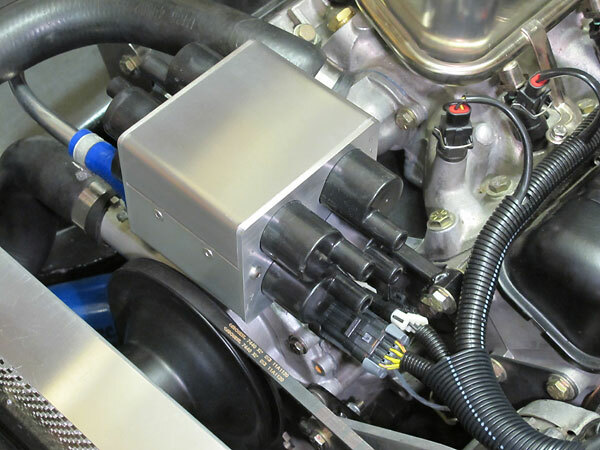 Aurora custom spark plug wires and Made-4-You Products "Smoothie Stac-Pak" separators. the tunnel has only ever been covered with paint. I've had a lot of time to think about covering it. 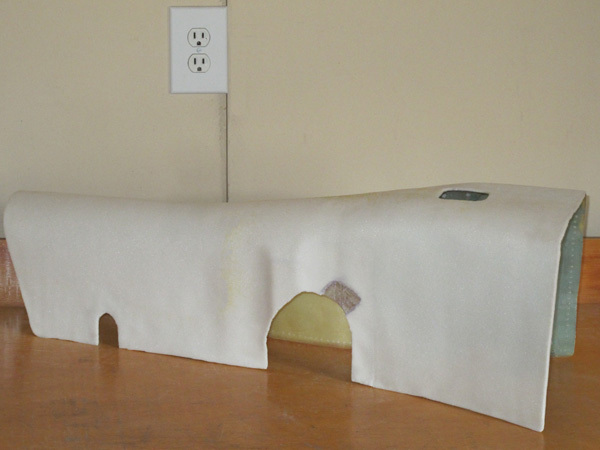 landau pad atop a very lightweight molded fiberglass structure. 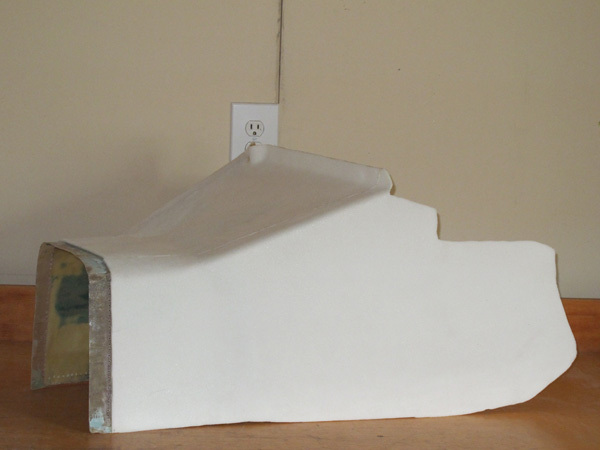 sandable/sculpable, 1/8" thick, closed-cell cross-linked polyolefin landau pad over the fiberglass. that secure a thin stainless steel protective shield next to the throttle pedal. 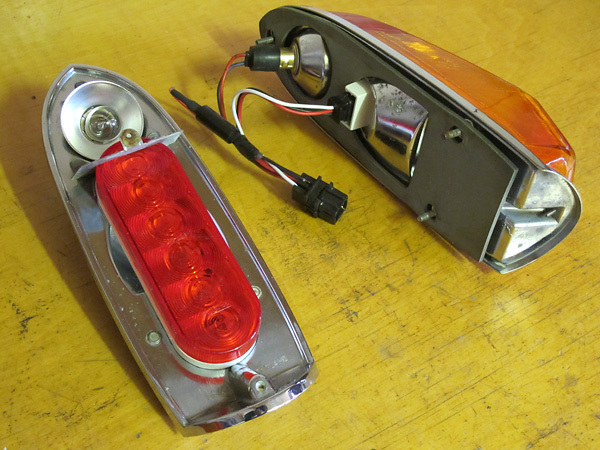 It's 2014, and almost every tractor trailer produced uses light emitting diodes for rearward lighting. them to illuminate in all three modes. 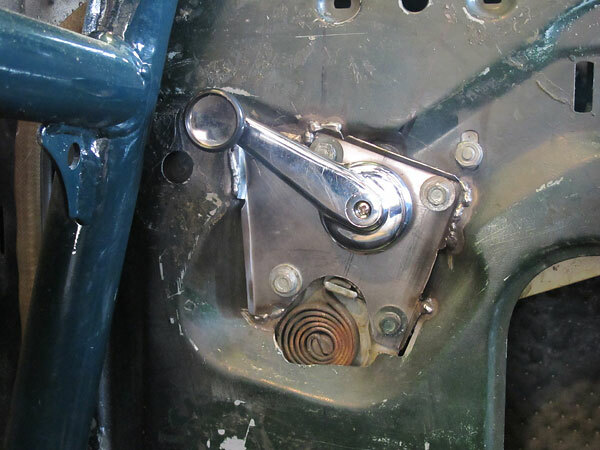 MGB's original incandescent brake and tail lamp feature remains. Bottom line: much more effective and also more reliable lighting. Total cost: less than $30. with the LED turn signals. Another diode keeps front and rear lamps from affecting each other. when the brake lights are applied. 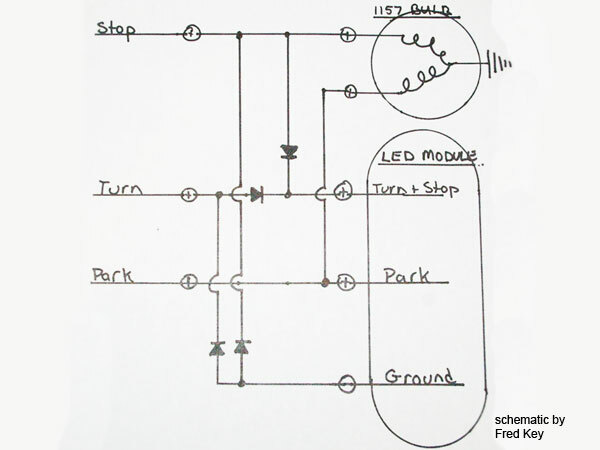 No relays are required, and I use an ordinary flasher module. When I installed the roll cage, I got the front hoop too close to the passenger-side window crank. Moving the cage wasn't practical, so I decided to clock the window winder bracket rearward. 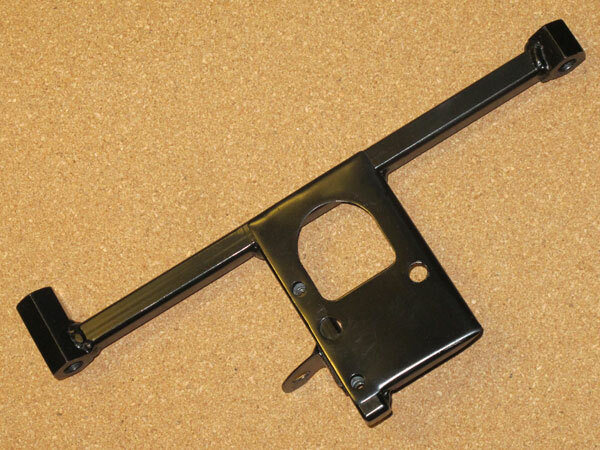 With the window crank in a non-standard location, a standard MGB door card won't fit anymore. door caps out of fiberglass. I made them taller than stock to be more comfortable as armrests. Of course they're lighter weight than stock too. I made door cards out of flat aluminum panels. 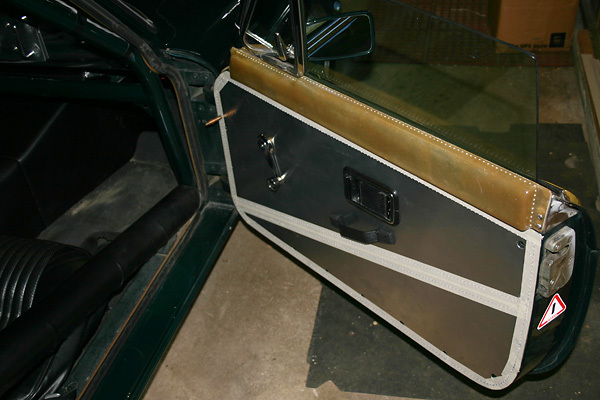 door panels and caps were covered with landau pad and then premium automotive grade vinyl. 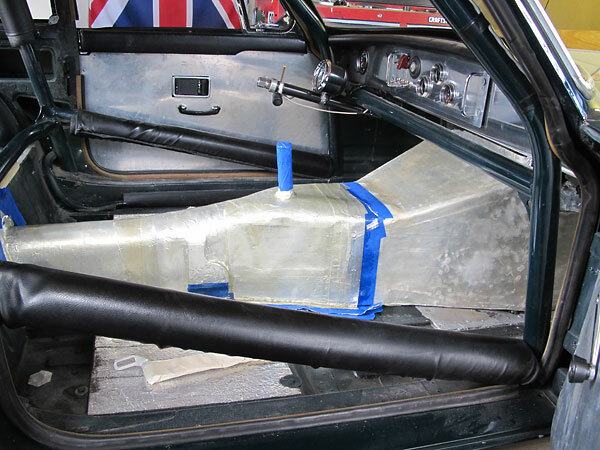 Stitching across the door panels was aligned to match rollcage tubes. 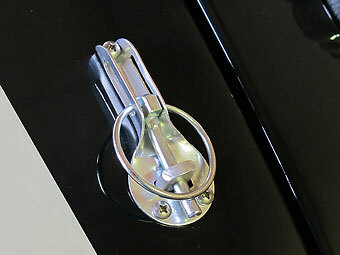 Stock 1972-only MGB door pulls were substituted for the earlier style. This is an "AFR Table" for my Buick/Rover V8 engine. Obviously the x-axis is engine speed. 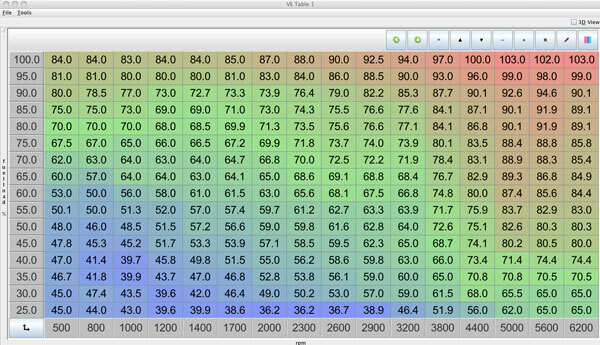 The table's y-axis is "Fuel Load %", which is derived from the MAP sensor's measurements. 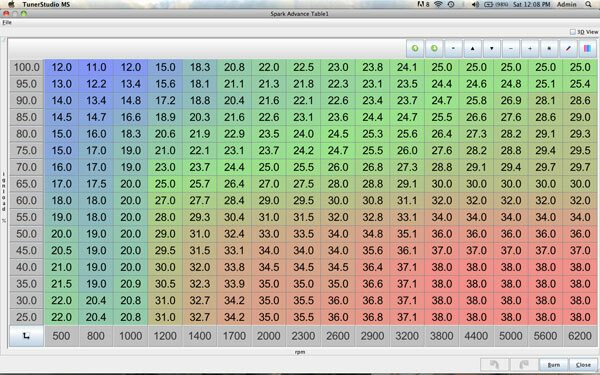 This is the exact same AFR Table, except converted into a "topographic map" view. 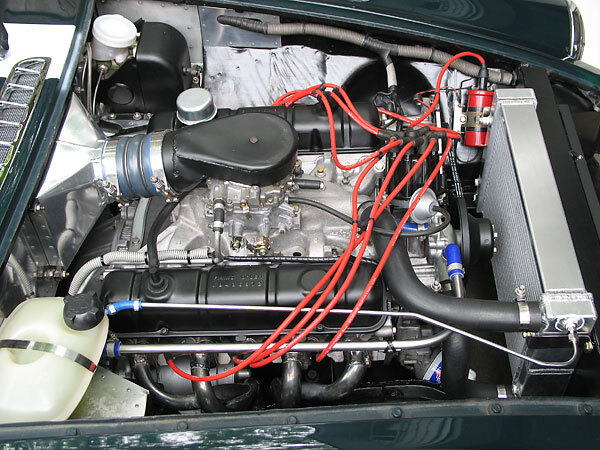 including for example its fuel injection system, camshaft grind, cylinder heads, etc. determinant for how long fuel injectors are pulsed for each combustion event. 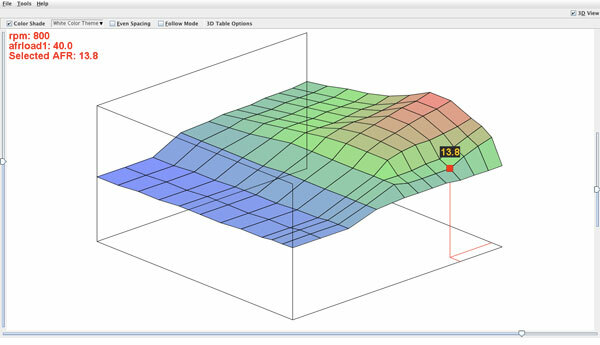 manifold vacuum, and the z axis shows ignition advance (in degrees before TDC). brake master cylinder and some related upgrades. Stay tuned. I'll post pictures and notes here. A Buick V6 "metric" oil pump facilitated doing away with the previous remote oil filter. I formed a shallow recess with a few blows of a ballpeen hammer. AC Delco PF47 (and similar) oil filters fit nicely. Vinyl hose and compression fitting for the oil pressure gauge. Click Here to see Photos from Bonnie's 2014 North American Tour! 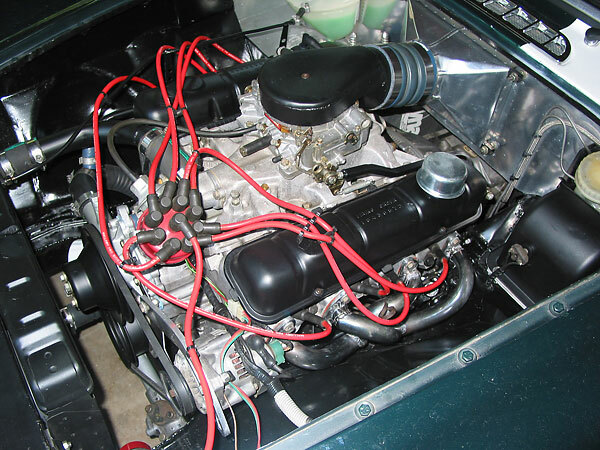 Engine: 1963 Buick Special 215. (Complete running car purchased for $150!) Bored 0.030" oversize, Kenne-Bell cam, Edelbrock carburetor, Mallory Unilite distributor, oil pump kit (longer gears), remote oil filter (home-made adapter). Transmission: 1992-model Borg Warner T5 5-speed manual. Transmission was purchased new (Rockland Standard Gear, $995). 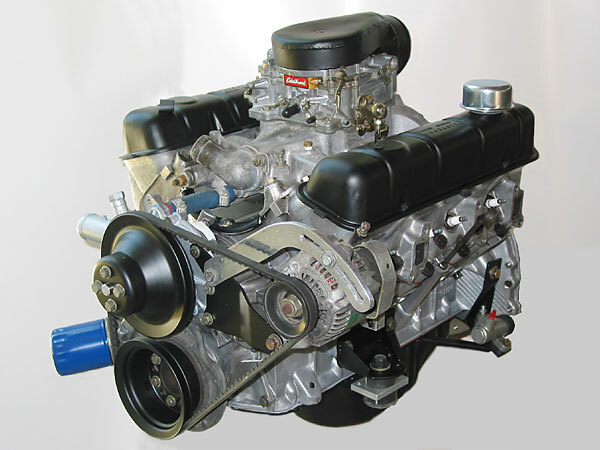 Transmission is the Camaro style with GM mounting configuration and 1-1/8" 26-spline input, friction-lined rings (instead of brass synchros) and integral shifter linkage. Bellhousing: 1963? Buick, purchased loose with T10 transmission. Clutch Slave Cylinder: Girling 0.87" bore. Cylinder mounting bracket and link with spherical rod end were specially fabricated. Clutch: 1992 Mercedes 190SL. Purchased new, no modifications required. Outside plate diameter is less than 9-1/2" so you can use it with the stock Buick pressure plate and with unmodified Borg Warner T5 trans. Exhaust: Home-made sand bent Tri-Y's. (These are really pretty!) Dual side exhaust with mufflers pocketed up under seats. Brakes: Cross drilled front rotors. Ford 9" drums brakes, redrilled for MGB lug pattern. Currently making plans for dual master cylinders and rear disc brakes. Rear disc brakes will be tricky due to limited clearance between springs and parking brake mechanism, otherwise aftermarket Mustang parts will bolt on. 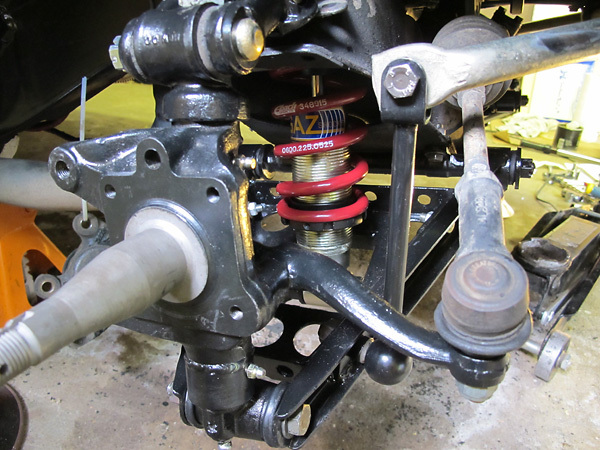 Suspension: Moss coil-over front suspension kit (highly recommended). Moss telescoping rear shocks (required substantial rework). (So did mine! - Ed.) Kingpins, steering, leafs springs, etc. renewed. 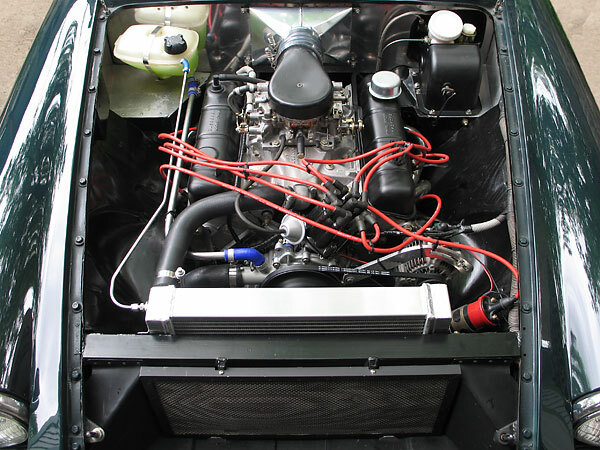 Cooling System: MGB radiator re-ported but not inverted. Filler neck removed. Plastic remote surge/fill tank fitted on firewall with a direct line to the water pump to prevent cavitation. New structure and ductwork around radiator fabricated for improved rigidity and airflow. (I didn't cut into the box section structure ahead of the radiator.) Twin 8-1/4" fans (from Honda Civic A/C system) ahead of the radiator. Low clearance fan rings fitted to increase efficiency. Home made steering column, aluminum dashboard, and interior trim panels. 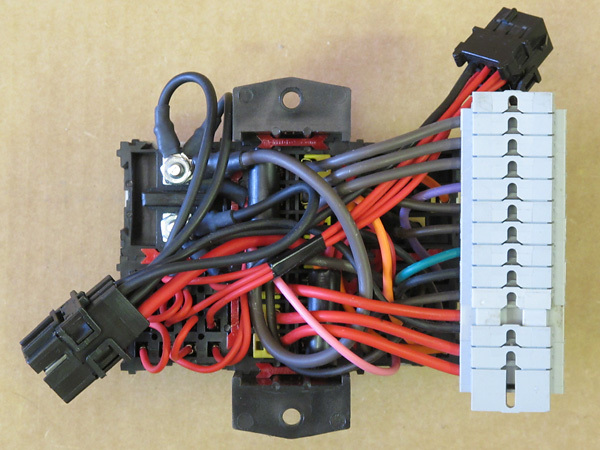 Modern wiring harness featuring sealed Metri-Pack connectors. Buick parts cost much less than Rover parts and are much easier to find locally. 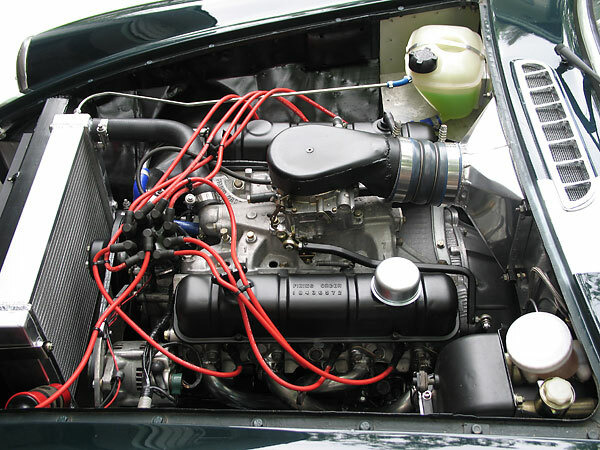 In my opinion, the ONLY reason British cars don't have as good a reputation for reliability as some other imports is the quality of Lucas electrical parts. 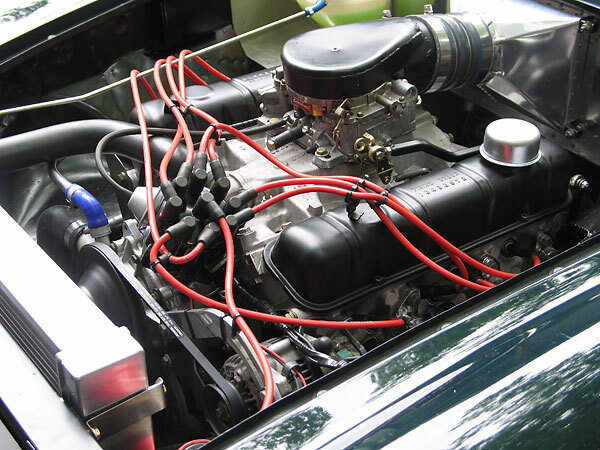 If someone is willing to accept the challenge of installing a V8 in an MG, they shouldn't be intimidated by rewiring the car with better quality wire, components, and technique. Switches and light fixtures are also very easy to upgrade. Why wait until they leave you stranded? For example, Volkswagen Jetta front turn signals fit a chrome bumper MGB with only a little modification. Many Japanese cars from the 1980s were fitted with side marker and license plate lamps than can easily be installed on an MGB. They look less clunky than the original, and they work really well. You can streamline appearance, save an amazing amount of money, stop opening up light fixtures to clean corroded contacts, and you'll be safer because of vastly superior modern optics. One of the custom motor mounts. Buick V6 "metric" oil pump, which angles the filter forward. Note: Pete at Mantell Motorsport blasted & powder-coated all the black parts shown here. 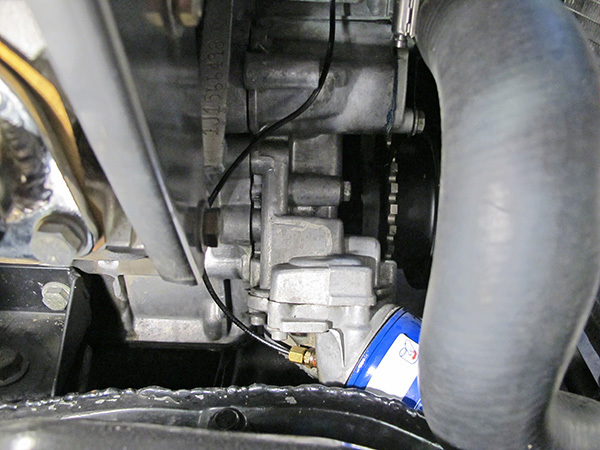 A compact Nippondenso alternator and an external clutch slave cylinder, both on custom brackets. on original Buick 215 heads. Upgrading heads necessitated significant alternator bracket modifications. that I had to enlarge the mounting holes in my precision-crafted headers! The radiator is directly above the anti-sway bar, not out in front. The Buick V8 engine is mounted further rearward than usual too. 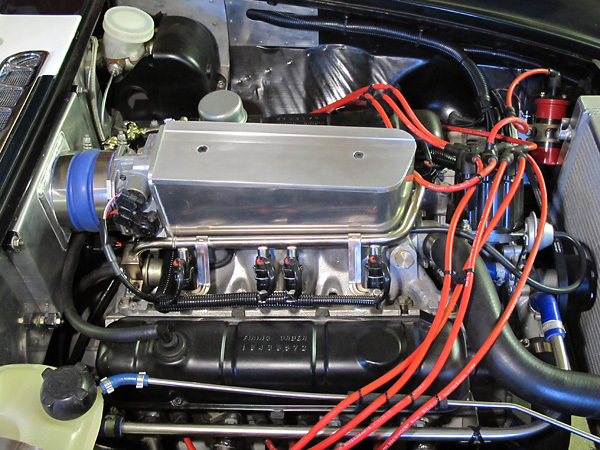 Cold air induction is one unusual feature of this Buick "215" engine installation. 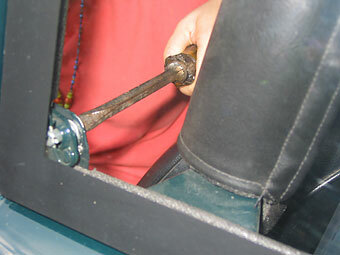 A throttle linkage is employed, in lieu of a cable. 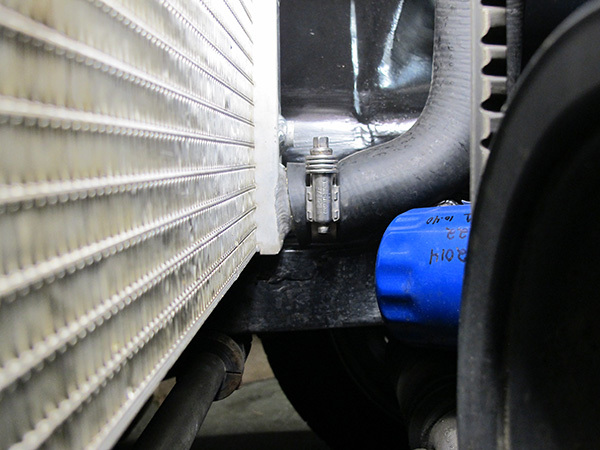 Stainless steel vent lines ensure self-purging of air from the cooling system. AFCO "Scirocco" dual-pass aluminum racing radiator (part number 80107N). Twin Honda Civic electric cooling fans. firing sequence, cylinders are paired as follows: 1 & 5, 3 & 7, 2 & 4, and 6 & 8. 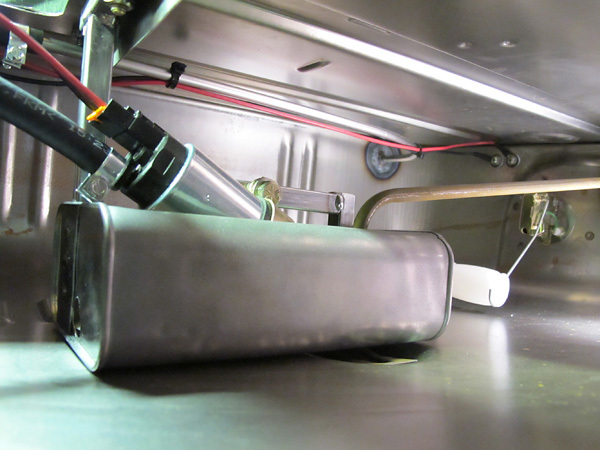 This photo shows muffler placement, muffler heat shields, and Lokar parking brake cables. Custom mount for a Girling slave cylinder, and shortened throw-out fork. Homemade Panhard rod attached to a Ford 8.8 axle. A doubling plate sandwiches and reinforces the trunk floor. 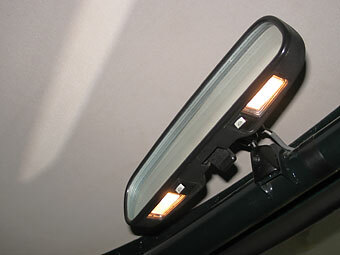 Left: Chevy S10 rear view mirror with integral map lights. Right: 12V power socket & binder posts. 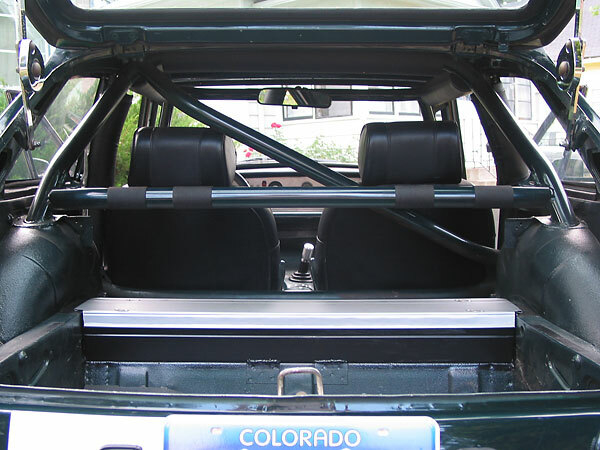 Six-point roll cage made from 1.75" seamless (DOM) mild steel tubing, w/ 0.090" wall thickness. 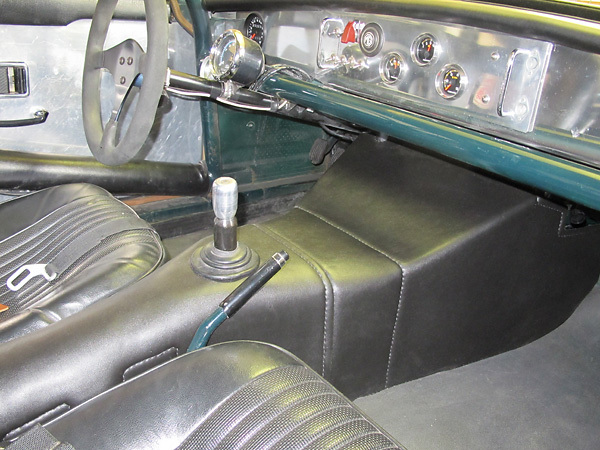 Note horizontal tubes under the dashboard, at shoulder-strap height, and low, behind the seats. 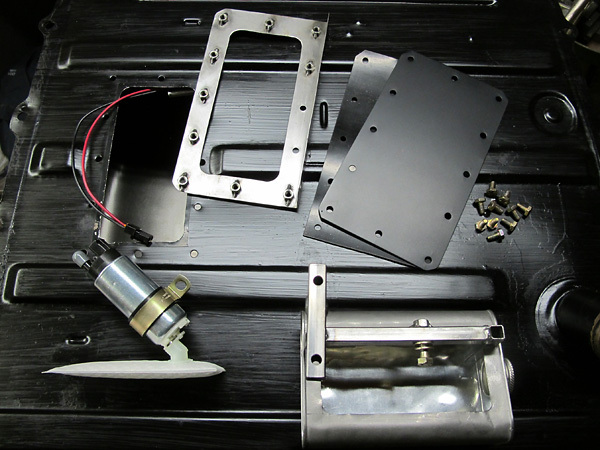 This photo also shows the built-in tool chest, with lid held down by Dzus quarter-turn fasteners. fasteners (three per window), and they're easily removable for ventilation. Righthand photo also shows one of many supplemental cage-to-body brackets. Panasport 15x6 -22mm wheels weigh 15.0# each. 205/50-R15 tires. Copyright: 2017. All rights reserved. Use by written permission from "britishv8.org" only.